Today was our six mile recovery run. This was a great chance for all of the AIDS Marathoners to run a nice easy pace while we recover from the 12 miler last week. We had a fantastic route. 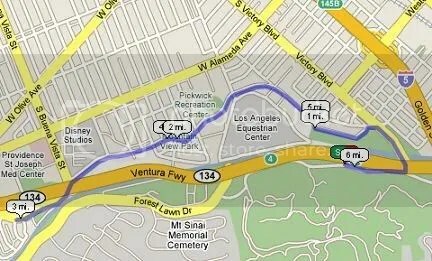 Out of Griffith Park on the north side and alongside Riverside Dr. through Glendale and Burbank. A simple out and back. I felt good throughout the duration of this run. Towards the end of the first mile, I stayed behind with my cousin Ashu, because he was going through some knee troubles. He had to stop and go back because he was clearly in too much pain. Get well soon Cuz! Since I was so far behind, I decided to latch onto another pace group…the 10 minute milers…I was able to keep up with them for about 5 minutes, but luckily at this point I caught up to my original group, and I was able to finish with them. This shorter run also gave me the chance to try out a couple of products. First, I still start will Accel Gel. Unlike PowerGel, I didn’t get nauseous from this gel. It tasted like the inside of a candy bar, and I was able to carry on with my run without any problems. I approve…and I think I will train with this next week for the 14 miler. Next, Superfeet. I put these insoles on my shoes on Thursday. I put them in my dressier shoes and experienced some initial pain. It’s more of a break-in pain, than an uncomfortable pain. After the first day, I was fine until…this morning. Running in the Superfeet was initially weird. During the first 2-3 miles, running in the insoles was a bit painful. After I got warmed up, my feet felt great. I will continue to use the SuperFeet. I’m fundraising and I need help. Please visit http://www.davenadkarni.org to help out.